This was a great hike to start the Summer hiking season, and I’m glad that my friend Chris suggested it. 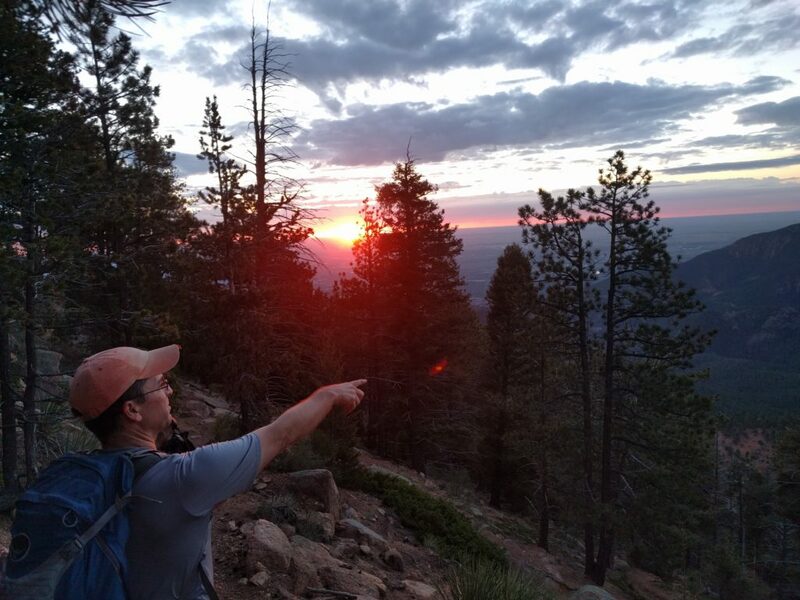 We started early at about 4 AM from the 4-way parking lot in N. Cheyenne Canyon park. At the parking lot we encountered some young people who were apparently wrapping up their partying from the night before. I’m glad to say that their idea of fun did not include any vandalism of our Jeeps (Chris drives a Jeep Wrangler, too). We hiked steadily up to St. Mary’s falls and onward up to Mt. Rosa summit (11,499′ elev.). 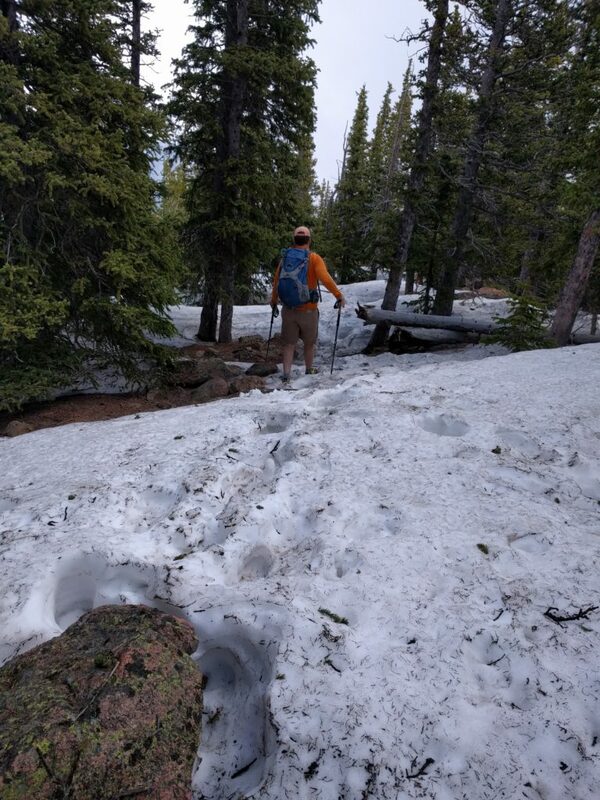 The last 500 feet or so of elevation included route-finding challenges due to snow drifts blocking the trail. But, we made it through with some minor delay and wet feet. At the summit, we hung out for about an hour enjoying the views to the West. Views East were mostly blocked by clouds. A chipmunk harassed us a bit and tried to steal food. The hike down was harder on me than the hike up. My knees and feet were hurting the last 3 miles. Today, 3 days later, I’m still sore but not injured. Stretching and staying hydrated is key to recovery. Afterwards, we had a nice lunch at Colorado Mountain Brewery at the Roundhouse on 21st street–recommended! A refreshing Hefeweizen was just the thing, after that long hike. This was my first outing with a new camera (Sony DSC-RX100). I wanted a new camera to replace the one that got waterlogged and ruined in New Mexico. This seems like a nice camera, but I still have a learning curve to get better video and photo results. 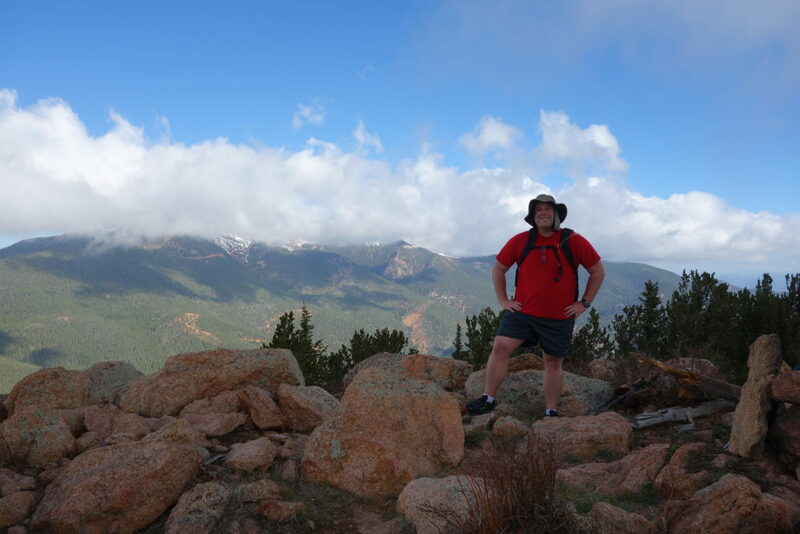 Looking forward to my next hike with Chris B. We’ve got a couple more in mind for this Summer.